How do you spell fun? We spell it F-I-A-T. The iconic Fiat 500 is going to rock your world with its groovy design, smooth road handling and out of this world technology. This funky Fiat subcompact car is available now at the Palestine Chrysler Dodge Jeep Ram Fiat showroom, near Athens, TX.A legend in its own terms, the Fiat 500 will soon be a legendary addition to your commute as well. This is one car that’s both fun to look at and fun to drive as it zips around town like a breeze. The Fiat 500 has bold updates and an alluring style that will have anyone you pass on the road doing a double take. The team at Palestine CDJR Fiat is thrilled to introduce you to this playful subcompact car because we know you’re going to love it just as much as we do. You’re about to see your city in a whole new light, the light of the Fiat 500. It’s the epitome of a hip, city travel companion who performs like a dream. Embrace curves, whizz down the road and look really, really good while doing it all. You will have an impressive 15 colors to choose from, so paint the town Rosso red, spit-fire orange or olive green; whatever your heart desires. You will feel like a brand new person in the same town when you’re out and about in your new Fiat 500. You take care of pushing down the pedal and the Fiat 500 will take care of the rest. Cruise control will let you set it and get on with your journey and a speed limiter will make sure you never go above or beyond you’re intended pace. There are 7 airbags on board ensuring complete peace of mind for the drive; enjoy cruising around and know that the Fiat 500 will take care of you along the way. The Fiat 500 is a lot like a shooting star; bright, fast and full of spectacular advanced scientific information. The hub of this tech is the UConnect infotainment display center. Navigation, music, communication and more will be right at your fingertips in an easily read and understood central command center. Hop in your Fiat 500 and you’ll definitely feel like you can take on the galaxy. 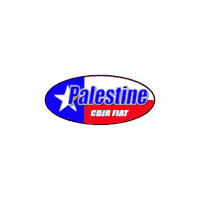 The team at Palestine CDJR Fiat is here to make all of your vehicle purchasing wishes come true. We would be honored if you allowed us to be your dealer of choice in the Athens, Texas area! We have a team of dedicated employees, who know our brands better than anyone else, that can help you learn more about the Fiat 500. You won’t be disappointed in our level of service, our state-of-the-art facility or our great selection. Visit our dealership Monday-Saturday, call us with any questions; even chat us online on our website for more information. We look forward to earning your business soon. It’s here and waiting for you at the showroom of Palestine CDJR Fiat, near our friends in the Athens, TX area. Come down to our dealership and one of our experienced sales professionals will be more than happy to show off this fun and zippy car to you. Once you see it in person, you’ll truly get a feel for how it performs on the road. The team is excited to welcome you to our dealership and into the Palestine Chrysler Dodge Jeep Ram Fiat family.